We have become huge fans of Heirloom Audio Productions and their Extraordinary Adventures of G.A. Henty Audio Theater Programs. All of these dramas are based on books by George Alfred Henty, and they do a wonderful job of "bringing real history to life." When the opportunity presented itself to review the newest release called With Lee in Virginia, we were thrilled. To top it off, we are going to be learning about American History this year in our Core Curriculum. It seemed like a great time to listen to a drama about the Civil War. I admit, my husband and I were the ones who were wringing our hands in anticipation while we waited to find out whether I had been chosen for this review. I have always enjoyed American History. With the current state of our nation, where it appears the federal government is getting way too powerful, it seemed like a wonderful time to take a look at a story that focused on a time of struggle with state's rights and what was going on in the lives of those who were considered the rebels. Before I tell you a little about the drama itself, I wanted to focus a bit on the CD set. Both CD's are securely held in a tri-fold CD case. The CD's are situated on the right and left side of the case, and there is a small, 4-page informational pamphlet in the center. The cover of the pamphlet is identical to the cover of the CD case. Inside, you will find details on how to access the study guide, along with information about Heirloom Audio Productions. Finally, on the back, you will find information about 6 of the main characters. Brian Blessed again plays G.A. Henty (or Mr. George), plus the audio drama features Sean Astin, Kirk Cameron, Chris Anthony, Kelsey Lansdowne, and Jim Weiss, among many other talented voice actors. I found it interesting that Kirk Cameron's son also plays a role in the story. The CD's themselves keep with the theme of the story as they are gray and blue, the colors of the Confederate and Union soldier uniforms. Under the CD's and informational pamphlet, you will find pictures of soldiers from the Civil War, along with the quote from Robert E. Lee that is included in the bonus features as a full-color poster. The pictures are a sepia color, except for the Confederate flag, which is shown in color. I also discovered that these pictures are actual images from the war and are included by courtesy of The Library of Congress. Such wonderful detail in just the packaging sure did whet my appetite for what was to come in the drama itself. So, what exactly is this audio drama about? I would like to share a bit about that right now. As the story opens, we are introduced to two teenage boys who meet up with Mr. George as they are running from the conductor on a train. Mr. George is meant to be G.A. Henty, and he is the one who is telling the story to the boys. The names of the boys are the same as the names of the main characters in the story being told. This is the same as it was in the previous dramas, though they are new boys, as Ned and Gerald must not have joined Mr. George on his trip from England to America. Instead, we are introduced to Vincent and Dan, who have found themselves on their own adventure. The story the boys and the listener of the drama are being told, begins at a time of unrest in our country. States are seceding from the union and the south is rallying for war. Vincent is a teenage young man who is the heir to the Orangery plantation. He has befriended one of the slaves, Dan, who is being whipped as the story opens. We discover Vincent's sympathies for the slaves, and find that he has a kind heart. Though they own slaves, he can't stand to see them mistreated, going so far as stopping a neighbor from using excessive force on his slave, which of course is illegal. This event causes him some confusion, as he is called a hypocrite for having slaves himself. Vincent's sympathies toward the slaves does play an important part in this story. His actions lead to circumstances that help to shape the way events unfold through the story. He enthusiastically joins the Confederate army to fight for states rights, along with his friends and neighbors. They spend grueling hours training for battle and are finally ready to fight against the Union forces. Battles are fought, God's will is sought, our hero finds himself injured, recovering and returning to battle only to wind up captured, then freed and on the run back home via a circuitous route. Through the non-stop action, we see a steadfast commitment to his duty and cause. Nor does he sway from his personal commitment to Christ. In fact, reading the Bible daily helps him come to a life-altering decision at the end of the war. As I mentioned, we have absolutely loved Heirloom Audio's previous releases. We have reviewed both Under Drake's Flag and In Freedom's Cause. However, With Lee in Virginia seemed to have more of an emotional pull on me. This is a story that is much more recent, and much closer to home. With the previous dramas, I didn't know the story behind the drama. Though the stories were brought to life in those CDs, something about knowing more about the Civil War (and the result of said war) made it even more real. To be able to look into the lives of important figures who fought for the south, a whole new level of understanding of the war has been opened for me. 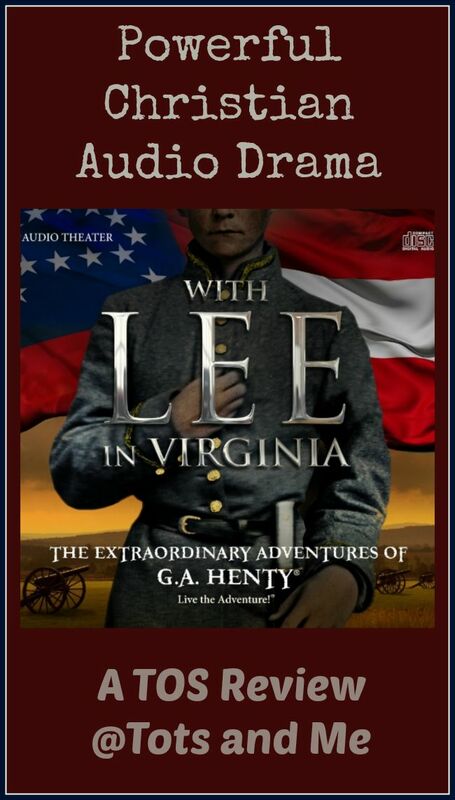 I loved learning how much Robert E. Lee struggled with his decision to resign from the United States army in order to take up arms and protect his "beloved Virginia" It's details like this that truly aid in bringing this audio drama to life. No audio drama can cover all of the events of the Civil war and this is no exception. Only a couple of battles are covered in great detail and others are only mentioned in passing, or not at all. Instead of spending time talking about minute details of battles, this CD focuses on the "human" story and the cost of war. Parents should be warned that there is an intense few minutes where Vincent loses 2 of his friends. The voice acting is done so well that it really tugs at your heart strings. Please be aware of how your young ones will react to such an emotional scene. 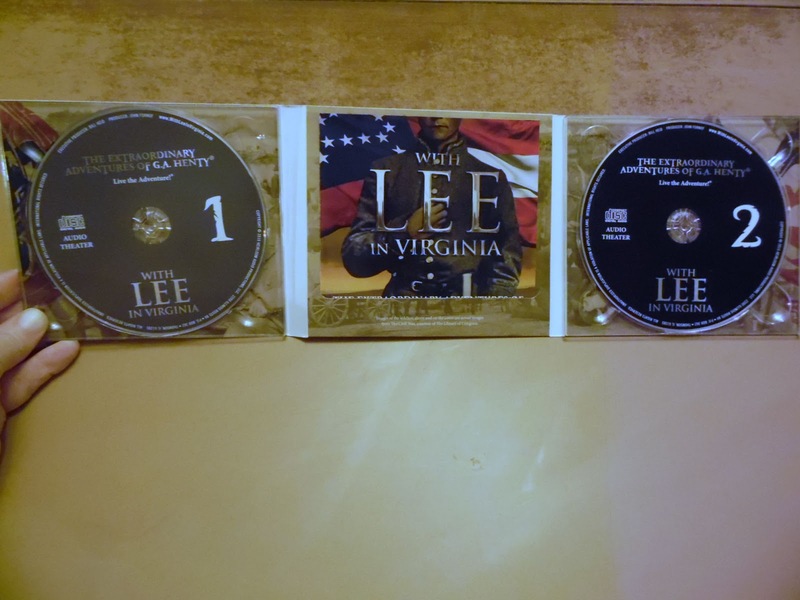 The children loved listening to "With Lee in Virginia" while on road trips or on a restful Sunday afternoon. They were able to answer the study guide questions and it did occasionally spur further, age appropriate conversation. 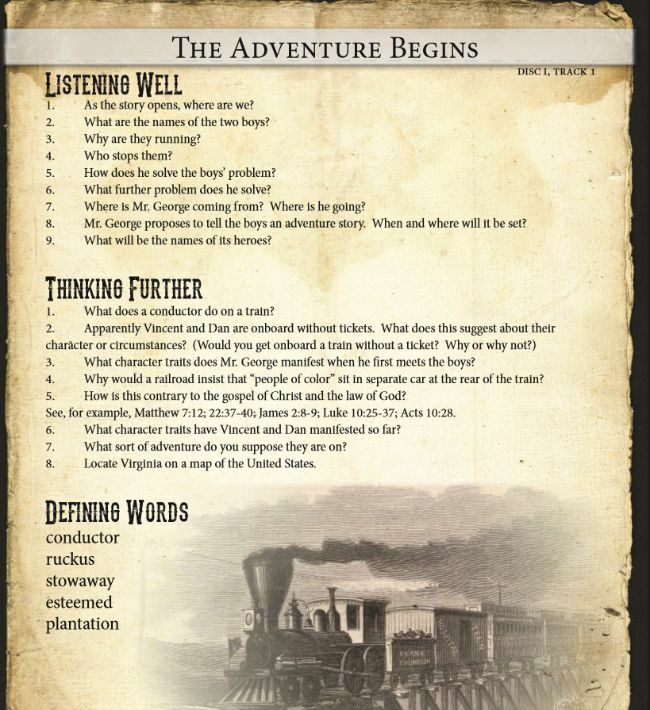 As you can see from the image above, the Study Guide provides simple, fact-finding questions in the Listening Well section, and then strives to dig deeper with the Thinking Further section. As the children are young, we focus on the Listening Well questions. We only spend a short amount of time going over the questions in one sitting, as the children get frustrated with having me stop the story. At this point, I am more concerned with making sure they are understanding what is going on in the story, and these discussion times help with that. We also discuss the Defining Words, or choose some of our own words to talk about. As the children get older, I can see the Defining Words being used for vocabulary exercises and sentence composition. Additionally, the Thinking Further Questions would make wonderful writing assignments. In addition to the questions that focus on each track, you will find biographical information about G.A. Henty, General Robert E. Lee, and General Thomas "Stonewall" Jackson. There is also map work, 2 Bible studies, and a section with information about sectionalism and slavery in the Bible. I asked the children what they liked about With Lee in Virginia, and this is what they had to say. Tabitha said her favorite part was "When Vincent is teaching Dan (one of the slaves at the orangery) how to read because he is reading the Bible and that is my favorite book." Amelia, however likes "When Vincent tells Dan that Lucy "likes to talk, and talk, and talk. And talk..." shortly after she had a shotgun pointed at his head. You'll have to listen to the audio drama yourself to hear how what happened with that one. Trust me. It's worth it. As with Heirloom Audio's previous audio theater dramas, I highly recommend With Lee in Virginia. There is a lot of knowledge to be found amid this wonderful adventure. You can find Heirloom Audio on Facebook, Twitter, and Google+. With Lee in Virginia also has a Facebook page. Don't forget to check out what my fellow Crew Mates have to say about With Lee in Virginia. Just click on the banner below.